My Father left that church back in the 50s, in part because of their banned books list – lucky for me, I guess. I’ve long wondered why anyone would stay with them. My father and his brother suffered terrible abuse at a catholic orphanage in the 1930’s. He turned out to be a highly intelligent agnostic alcoholic manic depressive. Strange thing is that he put me, my sister and brother into a catholic primary school. He then used us to convey his idea’s that God and Jesus were obviously made up. Naturally, we were not allowed to attend secondary catholic education. I look back now and thank my father for helping me become a complete atheist ex-catholic. Father forgiven by me at least. Subscribe, and three cheers for FFRF! If people didn’t leave when it was revealed that the Catholic Church was protecting child rapists, why would they leave now? In answer to your question, they haven’t left because they know that the gates of hell will not prevail against the Church. Take it or leave it. 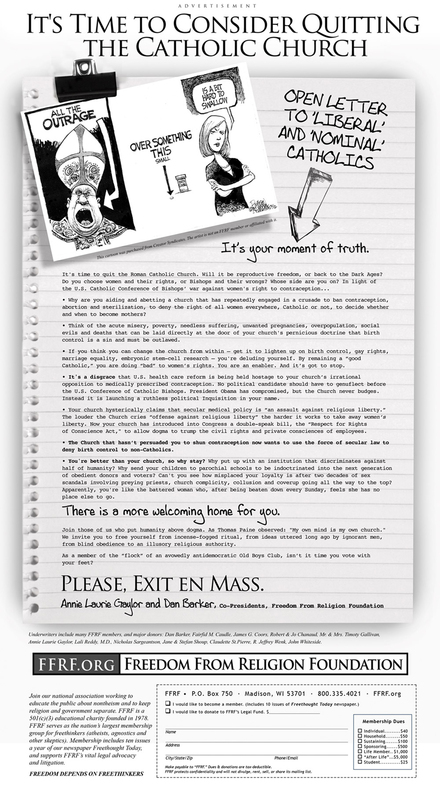 The FFRF ad begs liberal and nominal Catholics to leave the Church. As a committed, believing Catholic I join the FFRF, in fact add PLEASE leave. Liberal, narcissistic and cowardly bishops like Archbishop Weakland and Bishop Zeimann have made the Faith in the US and Europe a laughingstock, embezzling funds and importing clerical concubines from the Philippines because they don’t really believe much if any of what they teach. Their lives proclaim their real beliefs – all of which are in line with the FFRF. When these ordained turds have left the Church and taken their friends with them to, oh, say, Episcopalianism which is now making up their beliefs as they go along, the Catholic Church will be purified and make a stronger wintess to the truth of the teachings of Jesus Christ so maligned and abused by the current state of civilization. haha, three cheers for Sean. Instead of leaving the catholic Church you chould return and learn what it means to be a real catholic and practice in life what the church teaches you would be a better people and a moral country and growth would begin ..So sad to see so many people lost in their own ego and selfish thinking …. @Rico, clearly, you’ve never read Constantine’s Sword. Perhaps you should. If that’s too difficult, view the documentary. Same title, same author. You ever hear the saying Garbage in Garbage out Threw out history there have been bad priest and bad popes… but for the most part the Church and its preist and popes have done great things May I suggest you read the Catechism of the Catholic Church great book also easy to read ..
For some reason, the system put my response at #9. Please read there. You mean that misleading and worthless bit of propaganda mixed with mythology which anyone can interpret anyway he wants (and I do mean “he”)? Better you should remove your blinders and read beyond it. Constantine’s Sword is not about any particular priest, outside of the one who wrote it. Or, are you afraid to read it? You guys are all posting on the PICTURE PAGE. What are you smoking? I notice no one commented on the fact that liberal priests and bishops, devoted to “social justice” more than the Gospel and led by the Demonic Duo from the Johns Hopkins Sexual Disorders Clinic, Doctors John Money and Fred Berlin, misled the bishops into thinking that male-lusting priests who molest boys could be cured. Must be too hard to discuss fact instead of indulging in the dessemination of outrigth lies, vagaries and misinforamtion among a gullible, lazy public by entertainment, “educational” and news media. The reason is obvious – the Catholic Church remains a mirror to a society uncomfortable in its own sins. The mirror reveals the evil inherent in society therefore the mirror – the Church – much be destroyed. Well, if the cardinals of the Roman Church, some of them veritable fiends, have been unable to destroy the Church, the American public, deliberately illinformed, poorly educated, and managed with bread and circuses by a debased government can’t even come close to destroying the Church. They are too lazy to read uncomfortable truths and think for themselves since they have been gulled into being content with looking at screens filled with talking heads telling them what to think. Smoking? Dude, I only wish! Just waiting for it to go legal. Oy, I’m such a goody two shoes! The anger and lack of peace in oneself is the direct result of a porly formed conscience.If christians and those who claim to be catholic only lived what the Church teaches the world would be a much better place for everyone.I was once like you empty and cold intil I freed my mind from my selfishness and opened my soul to christ and the church it all makes perfact sense to me . I see the ads states “to keep religion and government separate”. But you are ok with the government tell the different religions what rules to follow and how to follow them. This sound like a double standard. it sounds like you are saying the Seperation of church and state is great one unless I want it to go the other way. @Bill, what makes you think I’m “ok with the government tell the different religions what rules to follow and how to follow them”? I expect the governemtn to protect each citizen’s civil rights. If your religion requires that you ignore my civil rights, THEN I expect the government to step in and tell you and your religion where to draw the line. You want to go to another country and cross that line, that’s up to another country. You want to burn witches in the USA? Because if so, then, yes, I do want the government to tell your religion what rule to follow and how: No murdering and no accusing others of being witches (as that accusation, alone, is illegal: slander). @docatheist: How is the Catholic Church treading on individuals’ civil liberties? No bishop, priest, or faithful Catholic is trying to catch a witch on fire that I know of. Please re-think your argument. My mother left the Catholic Church back in the 1950s as well. She married my father, a non-Catholic. She taught me that contraception was fine and much less risky than pregnancy. She only had one child, me. But thankfully I have turned this around, married for life, had 8 sons and found my way back to the True Church, the Catholic Church. I have 14 grandchildren now with only half my sons married. I am so thankful I have not used artificial contraceptives, and also that none of my daughters in law use them either. Deo gratias! @Leviticus, rethinking done and reflecting it back at you:: There is none so blind as those who will not see. You will not see that government support of Catholic restrictions on women’s reproductive rights via contraceptive coverage through health insurance is religious attack on the civil rights of women to decide for themselves — as Constitutionally mandated, according to the Supreme Court of the United States. If your church wants to tell your followers what do to do and for themselves, and your followers want to follow, fine. But, how DARE you presume to any rights, religiuos or otherwise, to tell the rest of us what to do, and even worse, based on your religion?